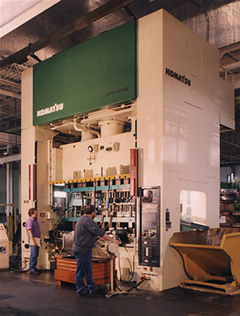 Our manufacturing facilities are fitted with presses having stamping capabilities from 15 to 440 tons. We have a full range of equipment to fulfill requirements for the simple to the very complex metal components. 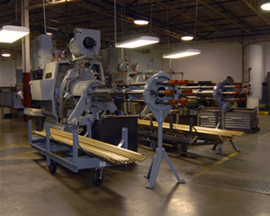 Specializing in mid to high volume production for OEMs and Tier One manufacturers, our economical, high speed production equipment and efficient manufacturing processes allow us to offer competitively priced solutions for customers throughout the United States, Mexico, Canada, Europe, and the Middle East. 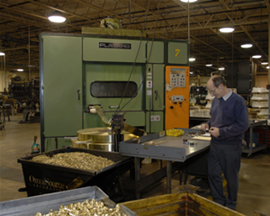 From deep drawing metal stamping, simple brass ferrules to producing ¼” thick heavy duty stainless steel stamping or aluminum stamping solutions, Winzeler Stamping Company has the resources and the capacity to meet your production needs. Certified to ISO 9001:2015, producing quality defect-free parts and offering customers superior service are our top priorities. Our depth of experience as an eyelet manufacturer and precision metal stamper has given us the ability to analyze production processes and in some situations suggest alternative operations that combine multiple piece assemblies into a single component. 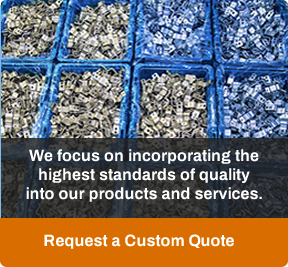 This value added expertise often leads to a more economical cost per part. Our in-house engineering & design staff, tool room, and multi-discipline production capabilities make Winzeler Stamping Company a solid choice for a manufacturing partner who cares about your success as much as our own. We welcome the opportunity to quote for you. Contact Winzeler Stamping Company for more information.